Links are the fabric of the web. And in the SEO world, how we view them and earn them has changed dramatically in the past 20 years. If you’re in the business of attracting traffic to a website and building brand awareness, you should care about how links impact your key performance indicators. As an SEO agency, we’ve written about how to get high quality backlinks in the SEO Tutorial. That resource covers link building best practices in black and white. But where personal experience and opinion are concerned, we have our own view of how links should be managed. While we are sure some people will disagree with some of these views, we created this declaration that outlines what we hold true when it comes to web links. Google likes links. Google does not like link building. Links are the “voting system” of the web, and Google believes that they should be earned. They are earned by the nature of the content as a result of it being useful or entertaining to a particular audience. Links are contributors to expertise, authority and trust. A link is a vote for a website. The more links it has, the more votes, showing Google that the website is one of authority. Within that, there are weighting factors for how strong the signal is. When weighing inbound links, a high expert ranking is a stronger signal than a spammy site. Content is a link magnet — without it there is nothing to link to. Content is the stuff the web is made of. It’s what people want to link to and share, and it allows you to acquire links naturally when it’s quality. Content needs to be relevant to your brand. The only way to become a subject matter expert in the eyes of Google is to have a themed website. A themed site happens when a brand contributes meaningful content to the conversation that it is an expert on. Sites that have too many topics all across the board are confusing to both search engines and users. Content builds trust … over time. As a website adds more and more content on a particular subject, the audience starts paying more attention to it. Do it at the right level for that particular community, and people will start remembering the brand. 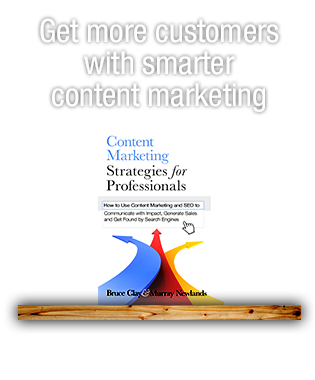 You need standout content to earn links. Millions of web pages are published daily. Content needs to be able to be noticed among all the content out there. Only a handful of web pages are considered relevant enough to make the first page of Google. In addition, create and follow a supportive outreach strategy to inform others of your content. In theory you have already earned the link through great content, but nobody knows about it until you tell them. “Unicorn” content gets a lot of shares, links and traffic. Publish content and pay attention to the popularity and traffic, visitors and shares. If it does well, then publish on that topic again, perhaps with additional content. Keep hammering on what people are excited about versus blindly following an editorial calendar. Know the competition and watch for their unicorns, too. Cheap content doesn’t perform. “Cheap” content can end up being expensive in the long run. You get what you pay for when low-quality content doesn’t perform for a site. As the saying goes, “The cheaper you want it, the cheaper you get it” — and that hurts quality. Hire true professionals, optimize the content, then publish. And remember that content contributes to a brand’s key performance indicators, brand awareness and ROI. Optimize articles to match the links. Make sure that your content uses keywords and is clearly relevant to linking anchor text for greatest positive SEO impact. While building links is a natural process, too many “click here” links could indicate that there is too much complexity to your page. Content, once written, needs to be reanalyzed and its inbound links evaluated. Opinion pieces, once you are an authority, get links. Establish your brand and its people as subject matter experts. With credibility in place, opinion articles become very valuable. Certain types of content get links. Articles showing the results of worthy research will get links; detailed and lengthy research articles do well. “How to” articles, because they are searched on a lot, also get links. Looking for inspiration for content worthy of links? 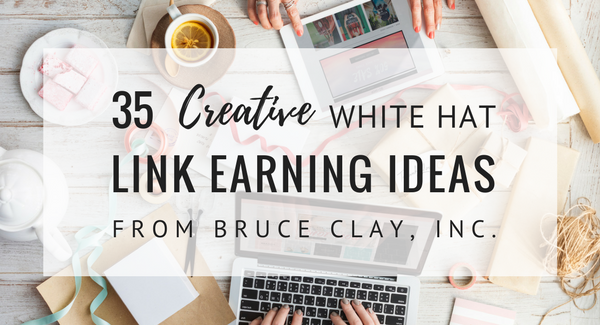 Check out these 35 link earning ideas. Evergreen existing content; don’t allow content to become stale. Content that was once great can age, leaving it less useful. Refreshing those pages and linking to them from somewhere else on a website can renew interest and, perhaps, links. Keyword and topic analysis drives content. Identifying opportunities to create content based on active keyword queries, social media topics and “unicorns” the competition has can drive important content for a website. If it is useful to others, determine if it is useful to you. Choose guest blogging partnerships wisely. Posting to other authority websites may make sense, but if the site is not considered “expert,” adding content there may be a waste of time. Choose carefully when vetting and strategizing your guest blogging opportunities. Google’s official stance is that guest blogging for links is against their guidelines. Link spam kills rankings. Google’s link scheme guidelines state: “Any links intended to manipulate PageRank or a site’s ranking in Google search results may be considered part of a link scheme and a violation of Google’s Webmaster Guidelines.” This includes: paid links, unnatural links, low-quality site links, off-topic links, widget links, footer links, run-of-site links (links in a template placed on many pages across a site), unpoliced post sites, reciprocal links, links from pages of all the same PageRank, many links from the same IP or sharing the same WhoIs, and links with the same anchor text. Google fights this link spam. Domain authority, however measured, helps. The authority of the linking site, while it’s not pure “PageRank,” does indicate expertise. In an ideal world, expertise and authority are what domain authority is all about. If a high-domain, authority site is linking to a website, in theory, that site will have elevated domain authority, because an expert links to another expert most of the time. Link relevance to a website and query are big ranking factors. The relevance of the page that’s being linked to should match the relevance of the page it’s coming from. But it shouldn’t be just about the target page; the words should also match how people search. When a link points to a page, that page and the anchor text pointing to it should contain keywords with high search volume that matches the content of that page. The theme of the linking site is important. If you have a link coming in from an unrelated site, Google takes that into consideration when evaluating links. Links need to come from sites that are in the same realm of topics as the site being linked to. The linking site’s quality counts. Google looks at the quality of sites linking to a website, and takes that into consideration when evaluating the site’s authority. Internal linking matters. Siloing is a way to theme the content on a website through links, and it helps the website become a relevant source on the topics it publishes. The technique helps search engines better understand what the website is about through the strategic organization of content. It is wrong to say that links make up a certain percentage of the algorithm, since the algorithm changes for every query. In 2016, Googler Andrey Lipattsev said the most important ranking signals were links, content and RankBrain. It’s still wrong, however, to think a third of the Google algorithm is based on links for every query. For every keyword, based upon the intent and geographic location of the searcher, the algorithm itself will vary the weighting percentage of inbound links. Major ranking signals include mentions. Online mentions are important for search engines because they help determine brand sentiment and whether people have an interest in what a brand is about. Social updates may not generate very valuable links to a site, but they signal to the search engine that people are talking about a brand. Social media works well for links; fish where the fish are. To catch fish, you have to use the right bait (what the fish are eating) and fish where the fish are. Write what the audience is looking for, and then put it in front of them. Social media puts the bait in front of the fish and catches links and traffic. Influencers with a large following can generate both links and traffic. Think of creative ways to engage the influencers in a space, whether it’s co-marketing, collaborating on projects, interviewing them, or having them write for the brand’s website. Including their opinion in “roundup”-type content can increase the content’s visibility by leveraging the influencer’s audience. Links from within your expert community are great. Every industry has a pool of “experts” — sources that are known as subject matter authorities. Links from other experts to a website show a brand’s authority. 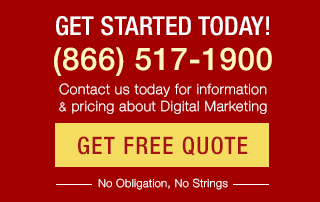 You can also partner with non-competing experts to gain PageRank and links. A competitor’s links are a gold mine. Identify sites that link to the competition and determine why those sites link to them. Then, reach out to those who link to the competitor, and offer them a better page to link to. When trying to get a link from journalists, put yourself in their shoes and their audiences’ shoes. Journalists respond to their favorite topics and news. The only good way to get a link from a journalist is to understand what they like, what they normally write about, and understand that they are writing for their audience. You don’t only want to pick a topic that a journalist may like; you also want to write about what their readers will like. In other words, target the journalists and their audience. Videos are link magnets. Make relevant videos and keep in mind duration best practices, then host them on a website and YouTube to drive links and traffic. Videos also contribute to a brand’s expertise. Use testimonials for links and conversions. A testimonial on a website helps with conversions, and it also helps with links. Give a testimonial to another site, and they will often publish the testimonial and link to the source (the site the desired link should go to). Good online reviews generate traffic and conversions. If you have a positive review, the sentiment is positive and will be considered by Google to be a testimonial — whether or not it’s passing PageRank. Email as a way to get links has been overdone. Sending email requests to try to get someone to link to you is played out and ineffective. My advice is not to bother. Broken links on your site are bad, but it’s worse if someone is linking to your site with a broken link. When a site has a broken link to another site, the user will arrive at the new site and see a 404 error page. The majority of people will have an immediate perception of a low-quality site when they land on the linked-to website. Identify incoming broken links and recover the link equity and traffic with 301 redirects. Broken links to competitors create an opportunity. Determine who has a broken link pointing to a competitor, and contact that website publisher and ask them to consider replacing that broken link with a link to your desired website instead to improve user experience with current and updated content. Local links are absolutely needed for local businesses. A company cannot be an expert in their region without having experts in their region link to them. So there you have it — my linking view. We urge you to follow these guidelines and hope your link building journey is one of safe travels. 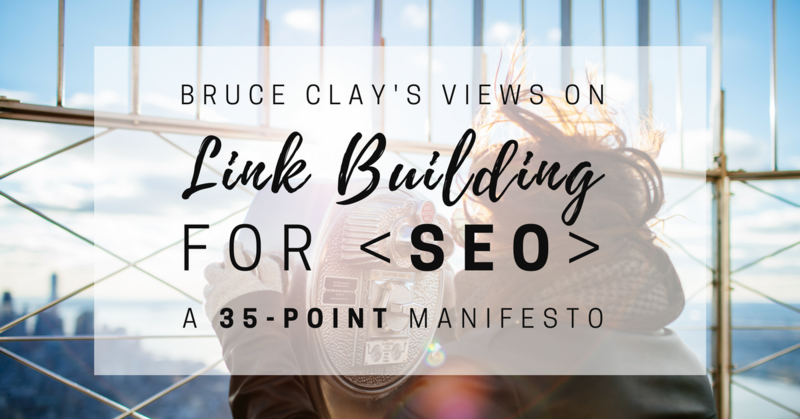 Do you identify with my views on link building for SEO? If so, share it with a friend or post it anywhere. This is a very well made and detailed article without pointless analysis. I recently found out that link building is the main way to increase free traffic in the long term from the organic search. I just started blogging and realised that in a hard way. Great post! Thanks for this wonderful guide! 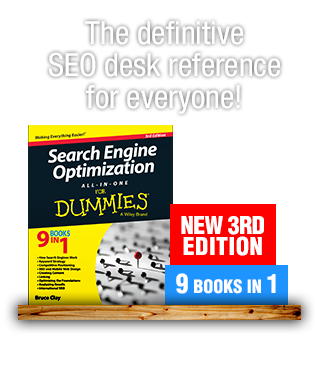 This will surely help to build quality backlinks. Welcome! We’re glad you are finding the blog helpful. This is my first time at bruceclay blog. And I must say it an amazing discovery for learning about link building and seo. Hey Bruce, Thanks again for a superb guide. Patience is the only thing you need to keep while back-linking your website. Because no patience will surely lead you towards black hat tactics. Hi Bruce. THanks for sharing this article. Thanks Sir for your sharing.I appreciate your efforts. SEO needs some practical optimization process which ensures high productivity. As an optimizer, we must have sound knowledge about link building which increases business visibility and organic position. Your tips are really actionable to identify the essence of accurate link building and content optimization and marketing processes. good abstract for actual seo-strategies, thank you for the overview! A great topic and well covered Bruce about links, the life blood of every website. thanks for the great ideas you laydown. Boom, you covered a lot here! I like your metaphor of getting a link likened to that of getting a vote. As you suggest, there are many ways to get a link/vote and it all depends on how you go about it. Great ideas in this post! Thanks Bruce! I’m sure it’s worth reading your views on link building & implementing it. What a great inventory of assertions and opinions about links and their role in SEO. There’s something for everyone in this article.